Karen is a Board-Certified Dermatology Nurse Practitioner, who has been working in dermatology since 2003. She graduated from Providence College with undergraduate degrees in chemistry and business. After a brief stint in research, she obtained her Master of Science in Nursing from the MGH Institute for Health Professions in Boston. 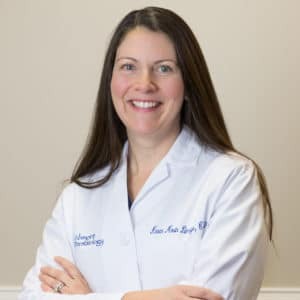 After graduation she worked as a nurse practitioner in otolaryngology before attending a Dermatology Fellowship program for nurse practitioners in Boston. She then went on to work at Mystic Valley Dermatology in the Boston area until moving to Pennsylvania in 2015. Karen has authored and co-authored numerous scholarly articles. She also enjoys giving professional lectures at local nursing programs. She is active in national dermatology communities and has served as president of the NEDNP Society. She has also served on the DNA NP exam board. As a Family Nurse Practitioner, Karen specializes in medical dermatology and skin cancer screenings, she enjoys seeing patients of all ages. She also offers a variety of cosmetic services, including Botox, Filler injections, and chemical peels. When she is not working, Karen enjoys spending time with her family, reading, exercising, and healthy cooking.